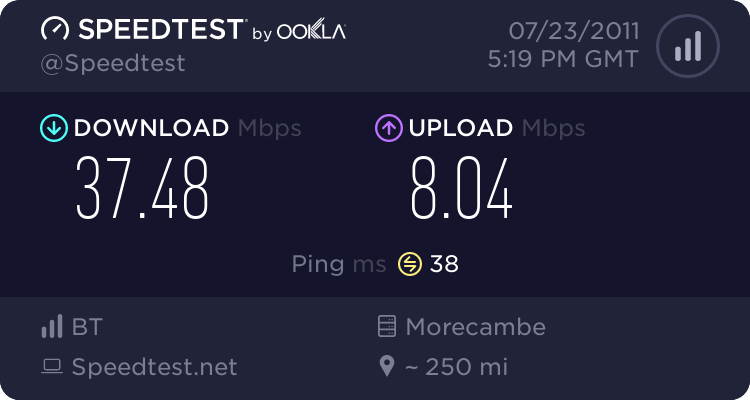 Ordered infinity last night and was given a speed between 4.5 to 11.5mb. This cant be right surely? I know these are estiminations, i did a sam knows check and its roughly between 29 to 33 on fibre. 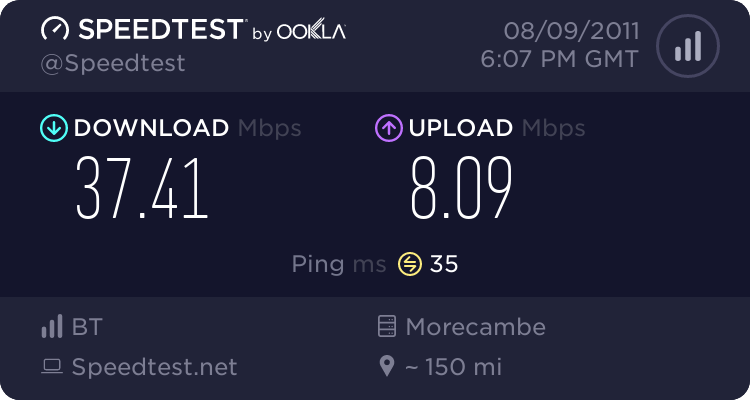 Whats interesting is that im in a FTTP area, will i be getting FTTC or FTTP? She did say i'd get up to 15 on the upload? Looking on the bt checker with my address i can get up to 100mb download and 15 upload. Also another issue, my master socket is in the lounge and the socket where i want it is roughly 10 meters away, can this be solved by re wiring the socket to an extension and the study socket is the master? Data extension kit can solve things if its FTTC, if full fibre, time to talk to them on the day they pull fibre into property. If you are a FTTP area you should have seen people pulling tubes and blowing fibre as close as 30 to 60m away from the property. The first place to check is the BT Wholesale Checker. This will give you a list of the available Broadband Options and estimated speeds. As for where you want the PC, as Mr Saffron has stated a Data Extension Kit can be fitted if required by the Engineer. The opening post doesn't makes sense Andrew. He couldn't order Infinity under 15Mbps, and does Infinity exist on FTTP? It does look, as you picked up, as if it's FTTP not FTTC, and that might explain a nonsense FTTC estimate. You ordered on the phone? You sure it was "Infinity"? Who from/where did you get the 4.5-11.5 estimate. The same "she" as told you 15Mbps upstream? This cant be right surely? Our check also indicates that your line currently supports an estimated ADSL2+ broadband line speed of 7Mbps; typically the line speed would range between 4.5Mbps and 11.5Mbps. Our test also indicates that your line could support an estimated ADSL 2+ Annex-M broadband upstream line speed of 1Mbps and downstream line speed of 7Mbps; typically the downstream speed would range between 4.5Mbps and 11.5Mbps. Thats ADSL+2, not fibre. Totally different. Thats what she quote me on the phone. You have either ordered ADSL2+, which is BT Total Broadband, or you have ordered an FTTP service. The figures you fave initially are a mixture of the two estimates, so something is wrong with what she told you. You cannot get 15Mps upload on the ADSL2+. Have you had any confirmatory emails? You need to check what has been ordered.